This was one of those books that just made your heart sing. I always love books that vacillate from past to present and back again as I think they give a unique perspective to the stories they weave. Told from both perspectives and moving alternatively backwards and forwards, this book is an actual triumph of writing. 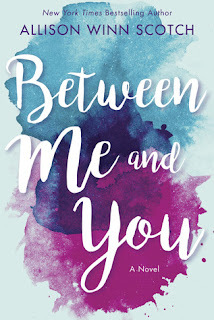 Allison Winn Scotch has always impressed me with her amazing ability to tell the most incredible stories; not incredible because of what happens but because of just how much you feel for the characters and what happens to them. I felt immersed into their lives and could not decide if I was more on Ben or Tatum's side during all of the drama and disagreements. I could not imagine how fame could separate a couple but I am sure that it does have its impact. I also could not imagine falling out of love with someone after they had stood by me through fame arriving. This book was one that spans a seventeen year period of time so sometimes I would have to actually pause to reflect on what the other character had said about the same time period in order to piece this book together properly. I think that the fact that I had to stop and think actually made the book stronger and almost larger than life as it simply consumed me. This book captured my heart and my heart actually ached at some times during the telling of the story of Ben and Tatum as I got that involved in them and the story of their love. Ultimately, I loved this book as I suspected I would and I may just read it again already as I loved it that much.